So I've talked before about the idea of a 'silent majority' act, groups that critics tend to treat indifferently or ignore for being bland, but attract a huge mainstream following for being just accessible enough to get airplay or a lot of sales, even if the buzz for the group is never that big. But there's a flipside to this, and I'm struggling to come up with the right term. Maybe you all could help me with this: this is a group that typically sits near the underground, never really builds up enough buzz to break through, and while critics tend to like them a decent bit when they release new material, they also tend to get lost in the shuffle a bit, never really getting a tremendous amount of attention. Such was the case for MisterWives, a group I actually caught live opening for Bleachers in 2014 before I actually reviewed their debut album a year later. And for the most part, I really quite liked that album - there were points that were uneven or overstated, but the energy and vibrancy made it clear this was a group that you should hear. Hell, I even put the excellent closing track off that album on my top 50 songs of 2015... and yet before this week, I wasn't even aware MisterWives had a sophomore album ready to go, or that people on Patreon were so eager for me to cover it. That, to me, was encouraging - I didn't have huge expectations, but if they had managed to refine some of the ideas and writing on their debut while keeping those big hooks and real momentum, this could be really fun. So what did we find on Connect The Dots? Okay, this is one of those cases where it's always a good idea to take a little more time to truly think about the record and give it those additional few spins, because when I first heard this, I was ecstatic - finally, the sort of indie pop that seemed to incorporate every criticism I made of their sound and improve across the board, bringing the energy and vibrancy that made their material so damn compelling on their debut! And yet, to step away from the hype I took a step back and considered things more carefully... and while I still think this is a great pop record, I'm not quite as high on it as I was a few days ago, because while it is definitely an improvement, there are flaws that really can't be ignored. But before we get to those, I want to address what many people will mischaracterize as a flaw on this record and I think will be misunderstood: the mood and tone. Quite frankly, following in the wake of Our Own House this record can be chipper and upbeat almost to an alarming level, kind of reminiscent of the pop music around the turn of the millennium that many people have come to appreciate nowadays, at least ironically. 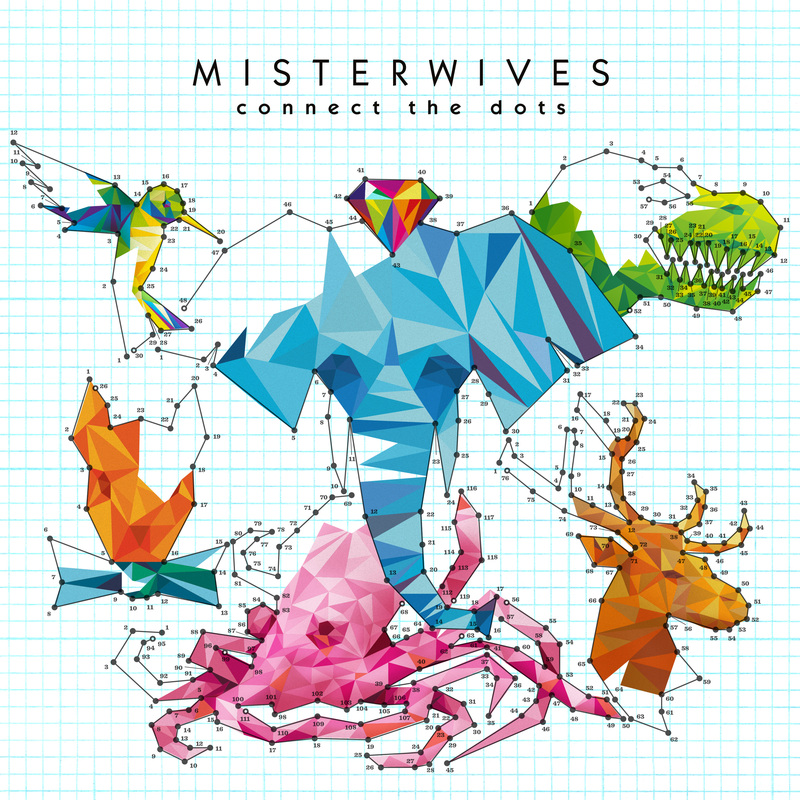 But irony would be the last word I'd used to describe Connect The Dots: my main impression from the production to the writing to the delivery is that MisterWives is a band that loves writing about and being a pop act with a ton of straightforward exuberance. Hell, with the horns and big catchy hooks and multi-tracked vocal harmonies you could trace a lineage for MisterWives to acts like S Club 7 - and again, that's a compliment! And while this is a record that feels modern enough to fit within the indie pop scene - they have a great drummer, I don't why they feel the need to inject some of the more programmed beats - they also have cleaned up several of the issues I had with their debut, most notably a much greater emphasis on strong guitar lines that bring some spiky new wave flavor that has all the color Paramore's last album lacked. And coupled with a mix that is a little more balanced in the midrange, it can lead to some monster hooks: the blaring stomp of 'Machine' and 'Oh Love', the fantastic rollicking grooves that anchor the title track and 'Chasing This', the bounce of 'Drummer Boy', even the very earnest slow swell of 'My Brother' - which in a funny way reminded me of their tourmates Bleachers, and with some of the references between the lines it almost seemed like a reference and message of hope to Jack Antonoff, and that gave it some weight for me. Now on the flip side, when the record does have so much momentum, the parts that seem flabby or stutter a little can get a bit distracting, with the slightly wonky groove on the prechorus of 'Only Human' for instance - and even without those, just like their first record it can be an overwhelming or exhausting listen, mostly because MisterWives aren't exactly subtle here. Which can be exasperating, because especially when you look at the vocals from Mandy Lee, they do have the capacity for it. Granted, it's not helped by the fact that her particular style of husky delivery has been adopted by so many modern pop singers, but I'd argue she does it better mostly through dogged commitment, a lot of multi-tracking, and the desire to ramp up the intensity. But again, that sort of huge earnest energy can be draining, especially when you start digging to the content and realize that for as much as MisterWives makes their story infectious, it can feel a little flimsy outside of it. Granted, you can tell there is insight and self-awareness between the lines, but what I think holds all these huge pop songs back from transcendence is that additional step or moment of thought. Take for instance 'Revolution', one of two songs along with the better 'Oh Love' that feels positioned in the aftermath of the election in the states - and while in both cases you can tell they don't really have the answers and they're sick of being gaslit be folks telling them to calm down, the big commitment to these anthems can make them feel a little lacking in direction. Similar case for 'Out Of Tune Piano', where again, they seem acutely aware of how weird it can feel to mine personal emotional pain for art and how it can have a complimentary emotional impact on someone, but the fact that they anchor it in a big 'Love Yourself' hook can feel a little, well, basic in more than one sense. Compare this to 'Machine', which could very well feel like your standard anti-industry 'we're doing things our way' routine, but it actually goes a step deeper and highlights that said industry builds pop groups to fall out of style and engineers a timeline, whereas they want to stick around. But as I said, MisterWives is an indie pop group that loves writing about being an indie pop group, and you can tell they gain the most thrill from this material - a little self-obsessed, sure, but it fits the very 'Millennial' style of this band, from the naked earnestness to the production trying to intensify the weight to the complete abandonment of irony. Can it feel a little simplistic in its approach, a little too single-minded at points? Sure, but there's something charming about that sort of earnest passion and the ability to tilt towards sincere bombast that really clicks for me, especially in pop. I can see this record falling into the exact same territory as that last Foxes album I covered that I really dug, and as such, it's getting a light 8/10 from me and definitely a recommendation, especially if you're a fan of much of the pop I described and especially if you liked that first MisterWives record. But honestly, this is the direction I'd love to see pop go in the mainstream: sincere, melodic, reasonably smart, and catchy as all hell, so I definitely advise you check this out!